In 2013, Sabil (Ahmad Al Khatib and Youssef Hbeisch) invited Hubert Dupont for a big concert at the Arab World Institute—a trio was born—and in Palestine for a tour in 2014 … followed by concerts in France and Finland. 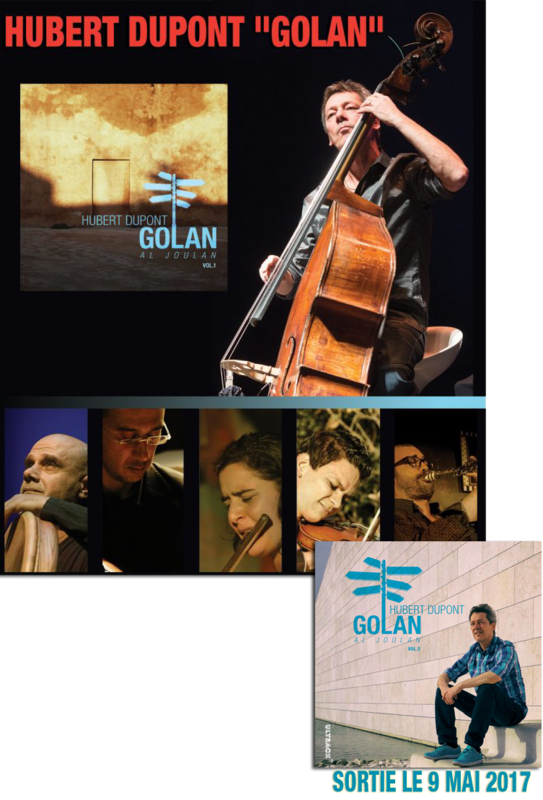 Musicians of research and improvisation, energy and emotion, the masters of oud, double-bass and percussions, express a longing for freedom that renews the oriental music with elegance and sobriety. They share a common taste for the unusual metrics, but also for the expressive force of maqams and modes in general, and for shared improvisation. Hubert Dupont reunited Youssef Hbeisch and Ahmad Al Khatib and three other musicians and composed a new program. While his musical language has become increasingly singular, he goes to the meeting of the most creative arabic musicians, and surrounds the lines and rhythms with an orchestral setting, rich in possibilities of interactions and especially rich in timbres, in order to play with the orchestra as an instrument. They’re even more driven to appropriate the different languages by a composer who knows how to go to the other without denying his own universe. The folk influence comes on strong, but the assertive voice of the modern jazz side of things is an excellent counterweight, and together the two influences combine for some textured melodies and a propulsive rhythmic force.